Looks delicate yet this beautiful plant is nigh on indestructible and will thrive in just about any well lit border. In summer it becomes surrounded by a cloud of dainty pinkish purple - the flower stems make a classy addition to a summer bouquet. A great plant to fill space in the border looking fresh and healthy throughout and needles to say needs little care. Despite its delicate appearance, this lovely plant is nigh on indestructible! More than happy to grow in even the poorest of soils and dappled shade, it forms a cloud of clusters of tiny pink-purple blooms on fern-like foliage. Spells of poor summer weather do not seem to bother it and the plant look fresh, healthy and colourful all year – a brilliant choice year-round interest. 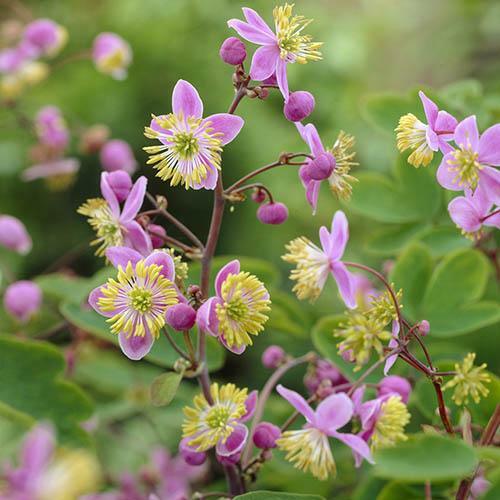 Ideal for mixed borders, it provides a lovely contrast against larger leaved shrubs and perennials and its haze of lilac blooms are not only great for filling up gaps outdoors but lovely for cutting and displayed in a vase indoors. A great all-rounder, give this top-performing perennial a go! Supplied as 3 plants in 9cm pots ready to plant out straight away.